Sycamore maple is a large deciduous tree; it grows as high as 100 feet, and its spreading branches bear opposite, 5 lobed, coarsely crenate-serrate leaves which resemble those of the sycamore tree. The leaves are dark green on top, pale and whitish beneath. The yellowish-green flowers grow in hanging racemes, producing eventually the winged fruit characteristic of the maples. Found in mountainous and upland areas of Europe and western Asia and cultivated to some extent in the United States. 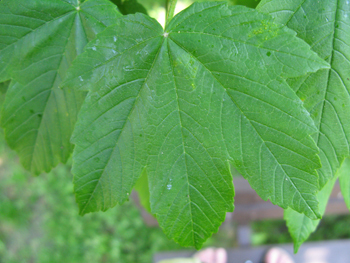 This tree has characteristics of the sycamore but it is a maple tree. 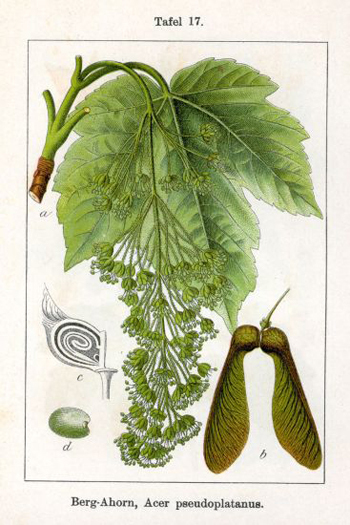 Sycamore (Platanus occidentalis) grows to 150 feet with bark that is mottled, multi-colored, and peeling. Fruits are globular. The bark has mild astringent properties and has been used to make a wash for skin problems and an eyewash for sore eyes. The inner bark of the tree, containing the sweet sap, can be used as dressing for wounds.